See ASA ruling A14-263404on the ASA website. Baby Milk Action has won another ruling against misleading baby milk marketing in the UK. 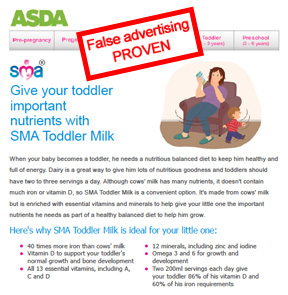 A ruling published by the Advertising Standards Authority (ASA) today (A14-263404) upholds Baby Milk Action complaints about a joint Nestlé and ASDA email promotion for SMA toddler milks (left). The advertisements implied children might not receive the necessary amounts of nutrients such as iron and Vitamin D unless they consumed the fortified milks. However, neither ASDA nor Nestlé are apologetic for being caught out misleading parents and Baby Milk Action is today filing a case against internet advertisements from Nestlé for the same products that make similar claims. “Nestlé entered the UK market with the takeover of the SMA brand in December 2012 and we are seeing the aggressive marketing strategies it uses around the world being unleashed in the UK. This is just one example; other concerns include its promotion of infant formula to health workers. “ASDA was extremely unhelpful when we raised this case with it directly, as with similar misleading promotions by Danone, Nestlé’s leading competitor, which owns the Cow & Gate and Aptamil brands. We asked the ASDA media office to comment on the promotion in light of expert opinions that these milks are unnecessary, and even potentially harmful. ASDA dismissed our concerns by citing Nestlé’s assurances about its toddler milk claims and refused to discuss the issue with us further. We were promised a response from ASDA’s legal and compliance team, which did not contact us, despite repeated requests. I asked ASDA if it will now alert recipients of this email promotion that it misled them and apologise, but it is clear that this is a forlorn hope. In its statement to just-food.com, Nestlé simply reiterated the justifications for its claims that the ASA found unconvincing. This and the fact that a banner advertisement is appearing on the internet today for the same products with similar claims suggest Nestlé’s statement saying it will comply with the ruling bears little weight. Baby Milk Action is filing a further case with the ASA about Nestlé’s banner ads. Mike Brady said, “Unfortunately neither ASDA nor Nestlé will be fined under the ASA system, there will be no corrections issued and people will be unaware they were misled if this ruling is not prominently reported by the media. Nestlé continues with its discredited attempts at justifying its advertisement and is running banner ads today with similar claims. The voluntary ASA system is not really fit for purpose is it? In 2012, the ASA upheld Baby Milk Action’s complaints about a national advertising campaign that claimed SMA is the best formula in a ruling against its then owner, Pfizer Nutrition. It is appalling that both Nestle and Asda can get away with this form of erroneous advertising for Toddler Milk. There should be a response re the inaccuracies, and apologies for misleading parents. It is not enough to simply withdraw, they should admit there was clearly mis-information.